Welcome to the Christmas Granny Square Blanket Crochet Along 2017! Find details on this CAL here. Find the materials list here. I’m so happy to have a group of people join in on the fun of making this crochet Christmas blanket! I hope this brings a lot of people together all over the world – to encourage, support, and just to have fun! If you’d like, you can join the facebook group here. The group is a place to share your progress on your Christmas blankets and ask crochet questions about the CAL, but it is still a general group for yarn friends to chat about yarny things! Listed below is the timeline of this CAL (crochet along) for the Christmas blanket. As you can see, it will span into late October. That is 9 weeks of fun, and you will have the afghan finished by the time December rolls around. 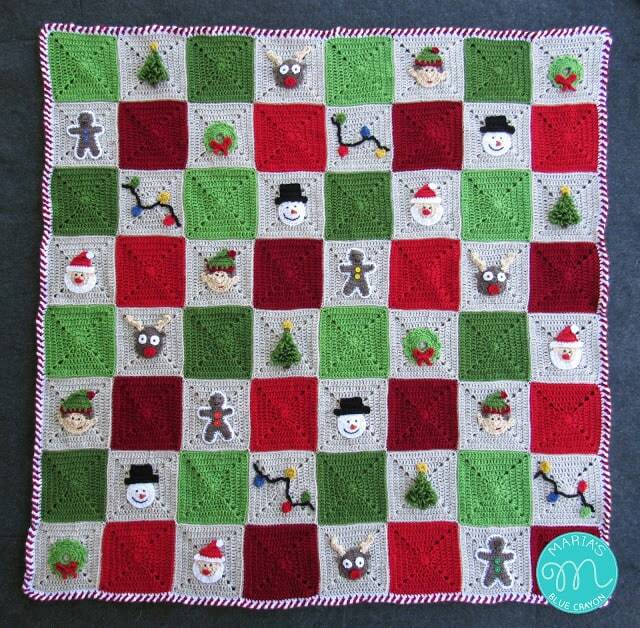 There is also an option to purchase the pattern for the Christmas Granny Square Blanket. If you’d like to purchase the complete blanket pattern you may do so here on Ravelry. This PDF file has everything you need to complete this crochet Christmas blanket. You may want to purchase this file in order to print out the patterns to have on hand and/or to work at your own pace. The file will include the crochet along time line as well! Every Sunday 12am (EST), the links will be updated on the dates listed below. I will also post on Facebook and send out emails to those on the mailing list (sign up on the side bar) when the ‘weekly assignment’ have been posted. PURCHASE THE ENTIRE COMPILED FILE OF ALL PATTERNS HERE ON RAVELRY.